As much as I love styling up the most fun and colourful outfits possible, sometimes I enjoy the simplicity of more 'basic' outfits. For some this look is definitely still somewhat of a statement, I understand, but as I'm sure you'll agree that for me this is most certainly a more casual, toned-down look. Somedays, however, this is simply how I want to dress! In Summer, for example, you'll more than likely catch me in a pretty dressed down outfit consisting of a slogan tee, straight leg jeans and a statement bag and/or shoe. 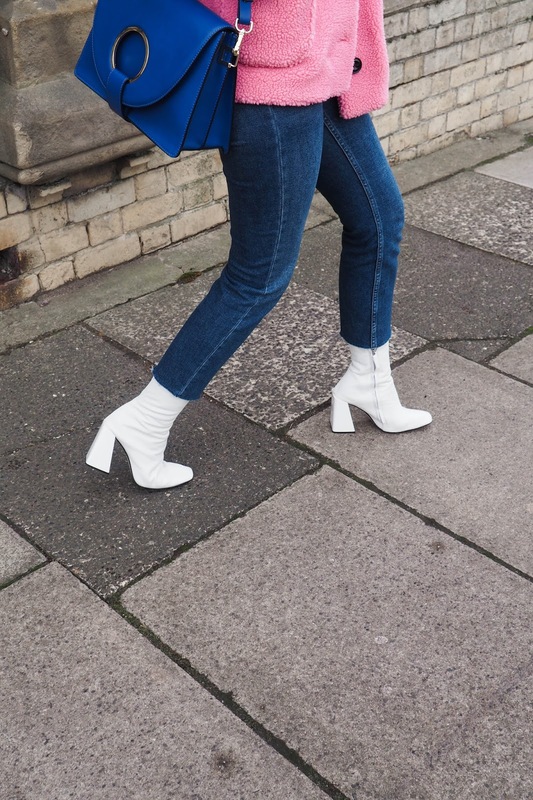 Often in Winter (particularly in the UK where it really is cold and miserable for 70% of the time), it's totally understandable to feel as though you've exhausted your wardrobe when this time of year hits. Which is why I rely heavily on my accessories to do the talking. 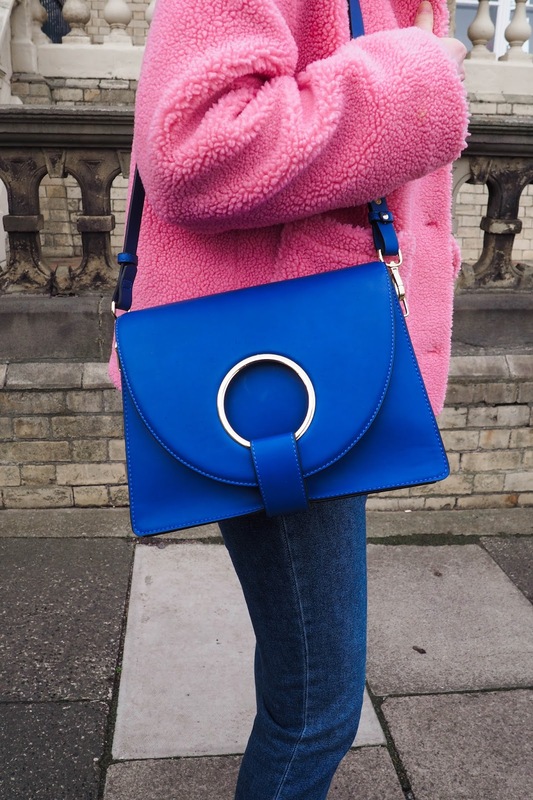 A basic outfit is instantly lifted with a pop of colour in a bag such as this amazing blue Topshop number, which I'm sure you're all sick to death of (sorry not sorry!). 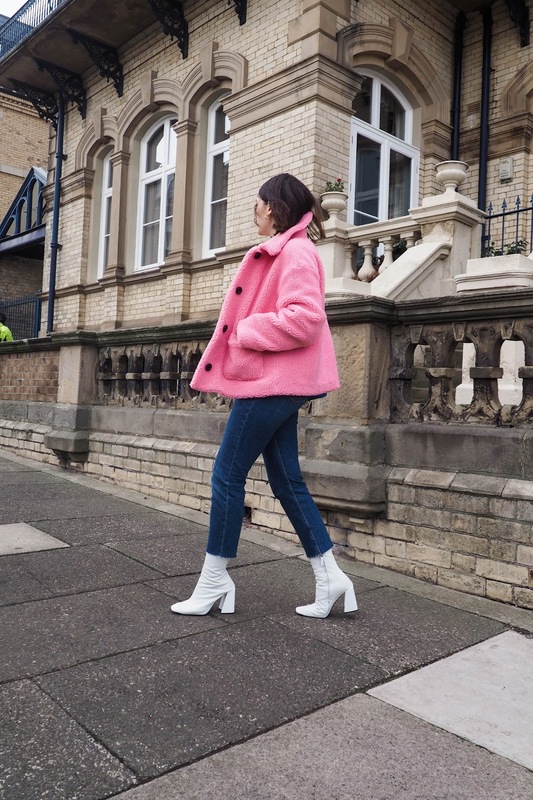 I actually really enjoyed wearing a more basic look than what I'm used too, especially if it means I get to wear my favourite Barbie-pink coat! I mean, who doesn't want to feel like a giant, pink marshmallow?! Paired with this cobalt blue shade, it's a total dream come true, dontcha think? This is a look I can wear time and time again and never tire of just by switching up the accessories. I think this outfit would look insane with a red bag and some black ankle boots! Or even an all black, fitted outfit underneath to let the coat do the talking, finished with black accessories and some form of hat if you're not too fond of lots of colour. 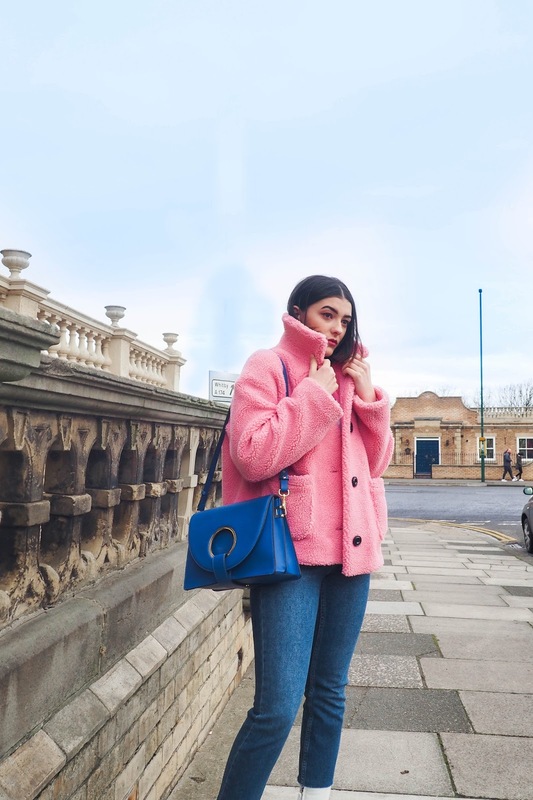 Honestly, I love a piece that is guaranteed to give me my cost-per-wear and this bubblegum coat is exactly that. If there's one thing you should have in your wardrobe this Spring, make it a colourful coat or jacket. You won't regret it! Such a gorgeous bag, the colour is so pretty! I love the bag, the boots, the coat - everything. You are such a babe! That look is so cute. I love the coat. I agree - on grey days a pretty pink coat is so good to wear. I'm also loving your white boots. I can't wait to rock them in the Spring! Thanks so much, Lyndi! Totally agree - they will be amazing in Spring! Simple, and chic! 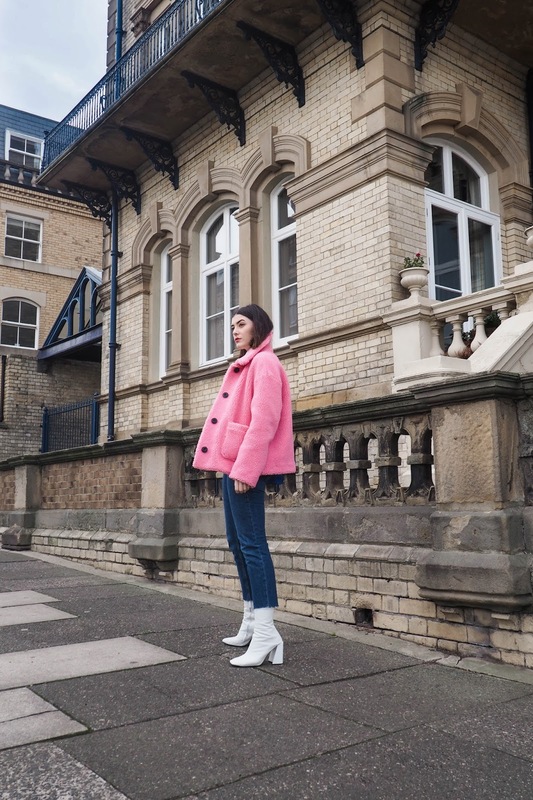 That pink sweater is definitely a headturner, and I absolutely love the white ankle boots that you paired it with dear! Thank you so much, Jessica! I can't seem to get enough of pink right now!